More clinical trials, promotion for digitisation and interoperability together with increased use of data generated by both healthcare and individuals. The duties of the Life Sciences office are plentiful. A few doors away from Vinnova at Mäster Samuelsgatan in Stockholm, in the premises of the Näringsdepartementet (the Swedish Ministry of Industry), you will find an office that may make a significant difference to Swedish medical technology in the next few years – the Life Sciences office. Head of the office, Jenni Nordborg, is working here three days a week, and today is one of those days. When we meet, it has been almost two months since the election of 2018, which turned out to be the beginning of an autumn of great parliamentary uncertainty. The government that will eventually be installed in Rosenbad, Sweden’s seat of government, will have many crucial decisions to make. One of them is how the coordination function of the newly established Life Sciences office is to advance their work in the future. – We still need to work in this manner. 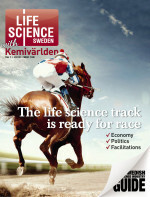 There is an awareness that we need to collaborate to get a more efficient functioning life sciences sector in Sweden. 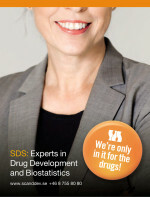 With everything from health and care, a competitive export industry with high-quality jobs, education and research issues, this is a complex area that transversally affects many ministries, explains Jenni Nordborg, who still has her half-time job as Head of Health at Sweden’s innovation agency Vinnova. The Life Sciences office was commissioned by the Social-Democratic Government in February after the former Life Sciences Coordinator Anders Lönnberg (S) presented the proposal. The Swedish Life Sciences office is modelled after the Office for Life Sciences, placed directly under the British Government. Today, the Office for Life Sciences has been established and carries out its duties regardless of the Prime Minister or leading party. The Swedish office was assigned the task of promoting the development of knowledge, innovation and quality in healthcare, the care sector and at universities and colleges. The office also undertakes to improve the conditions for life sciences companies that set out to establish themselves and work in Sweden. – Other countries work in a similar manner, Denmark for example, says Nordborg. The Swedish Life Sciences office consists of several officials from the Näringsdepartementet (the Ministry of Enterprise and Innovation), the Utbildningsdepartementet (the Ministry of Education and Research) and the Socialdepartementet (the Ministry of Health and Social Affairs). The duties vary, but concern matters regarding health, care, research, export and investment. One of the major tasks for Jenni Nordborg this autumn has been to provide the basis for a national life sciences strategy. She accomplishes this by listening and collecting suggestions and opinions from all fields; academia, business, patient and care. 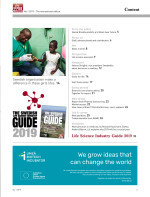 – Life sciences is not just a job for the government and the national level, but it is vital that they participate and take responsibility together with county councils, municipal principals, industry and academia, and together with the patients. Is the office sufficiently staffed to be able to accomplish the task? – In my opinion, we will need an even more distinct capacity function in the future, but this coordination team is an adequate solution right now. What political initiatives are you hoping for? – In the future, we will see an increasing need for innovative treatment methods, as well as preventive solutions. We see that medical technology and diagnostics are combined with brand new digital working methods and new drugs - making the life sciences sector a future industry. However, global competition is tough. The provision of skills and lifelong learning play a crucial role. Many inputs to our strategy work are about ways to improve our capabilities in system innovation and the use of data, as well as access to our leading and central infrastructures that we actually do have. Is the care sector behind you? – Yes, it would not be possible without the collaboration of patients and healthcare practitioners. Representatives of all groups are included in the coordination group. They are the foundation of the office and the future life sciences strategy, together with industry and academia. What is your primary role; an expert group, opinion makers or a working group? None of those actually. We are a coordination group and I work for collaboration. 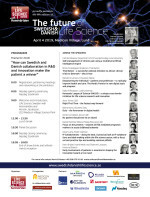 What is the state of Life sciences-Sweden? – Life sciences has attracted positive and intense attention lately, and the awareness of this field is high. Internationally, we are very attractive, acknowledged for quality and creativity. However, we are not doing particularly well in the field of solutions for the entire data infrastructure and collection and use of data, and I mean all data. Our records and biobanks, health and health care data, health records, etc. These fields call for improvements if we are to lead the development towards more and more efficient follow-up and access to real-time information. When will your work be finished? – This is not a one-off effort but long-term work. We are now looking into the formal structures that are necessary to launch the strategy process next year. We must find a common pace because many regions are currently working with strategies and we are working on a national structure, but those looking at Sweden from outside will observe a need for coherence. We need to send a consistent message internationally,” says Jenni Nordborg. Darja Isaksson, Director General, Vinnova. Sara Riggare, Engineer & Researcher, Karolinska Institutet and Patient.